Q. I know that some people wash their hands (mayim acharonim) before bensching (the Grace After Meals). Why don’t they say a blessing when doing this? A. 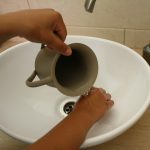 You seem to be looking for a parallel to the b’rachah for washing the hands before bread. In that case we are dealing with a mitzvah which entails saying asher kid’shanu b’mitzvotav v’tzivvanu – “God sanctified us with His commandments and commanded us…”. In contrast, mayim acharonim is explained by Maimonides as an emergency measure in response to possible danger (Hil’chot B’rachot 6:1). According to the Talmud, during a meal “the salt of Sodom” can adhere to the hands and, if you touch your eyes without washing the salt off, it can affect your eyesight. Whether or not this view is medically justifiable, it is worth quoting the view of the Magen Avraham (17th century) that some things deemed by the Talmud dangerous to one’s health – e.g. eating fish baked with meat (Pes. 76b) – might no longer be harmful, but this does not allow an individual to decide for him/herself that an established practice may be wantonly discarded. Mayim acharonim recalls the halachic concept of pikku’ach nefesh, the basic Jewish principle that taking risks with one’s life or health is not allowed and, if there is an emergency, immediate action is necessary.